I know the name is a mouthful, but how would you name this masterpiece??? 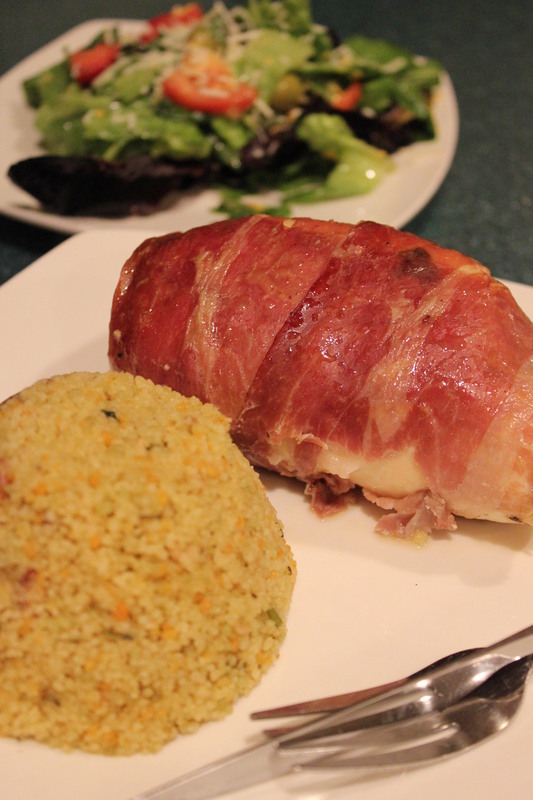 I love love love how this came out, the chicken was slightly crispy on the outside and juicy on the inside! The combination of sweet and salty was outright exceptional. 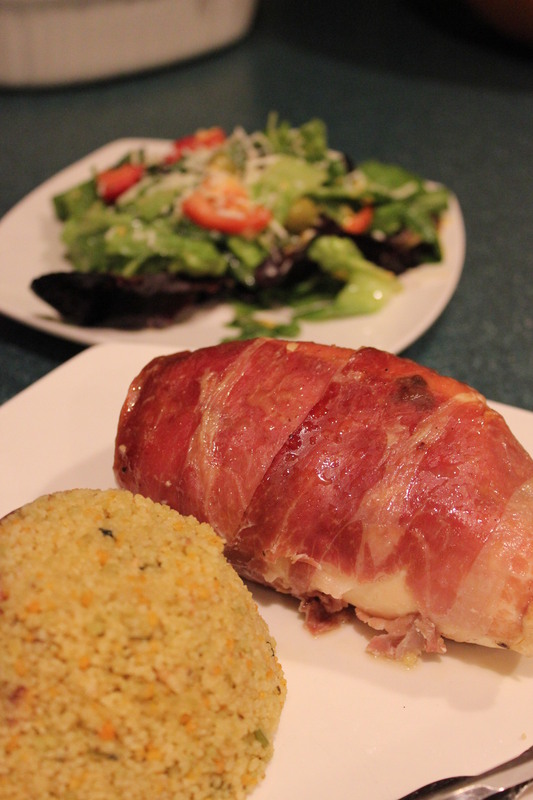 I used maple bacon; this gave a great balance to the saltiness of the prosciutto! 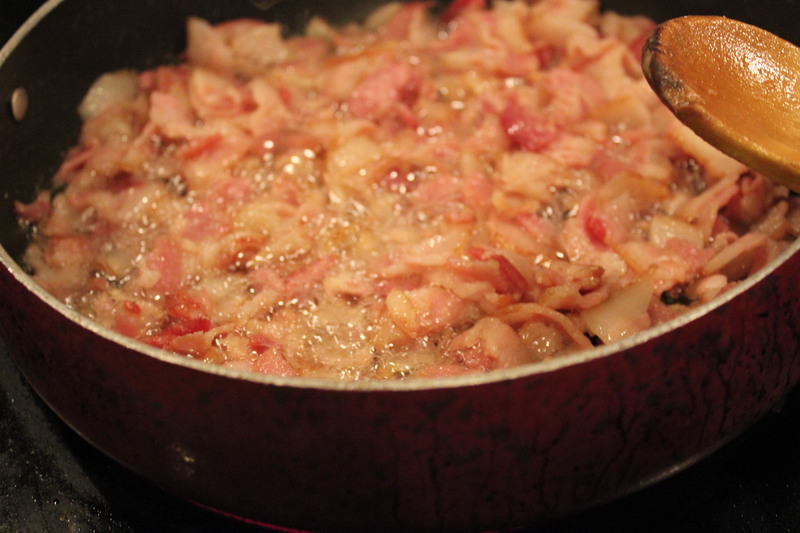 If you have a preference you could use regular bacon, or even skip it all together. 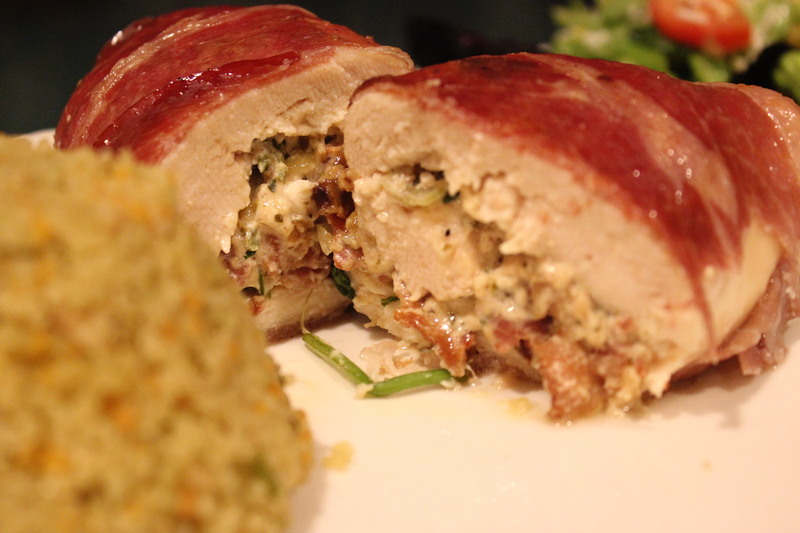 I like to use bacon when I am stuffing chicken, it is a great flavor (who does not love bacon) and the fat that continues to melt while cooking infuses that wonderful succulence into the chicken. You would be hard pressed to have this come out dehydrated. (We all know that has happened to us) <—— Don’t deny it! This although easy is a bit time consuming; I believe it is worth the end product. 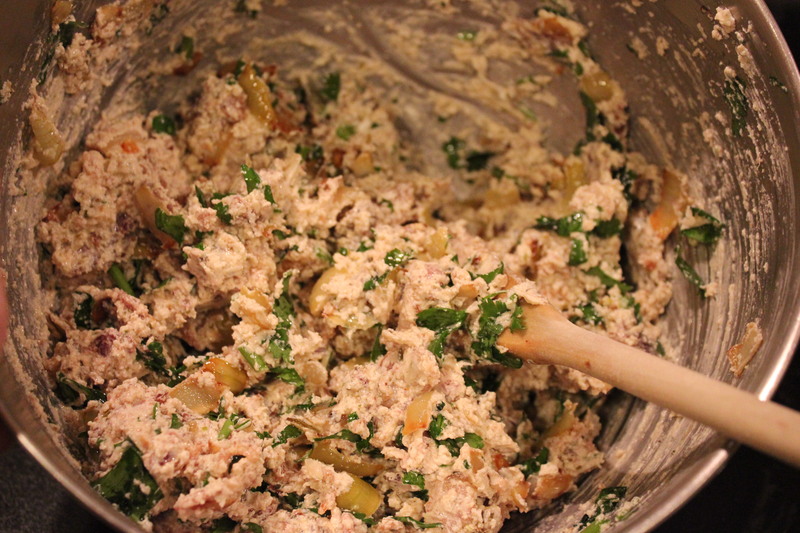 If you stuff the chicken the night before this will trim a bunch of time off the preparation the evening you serve this. Because of that this makes a great meal for guests. 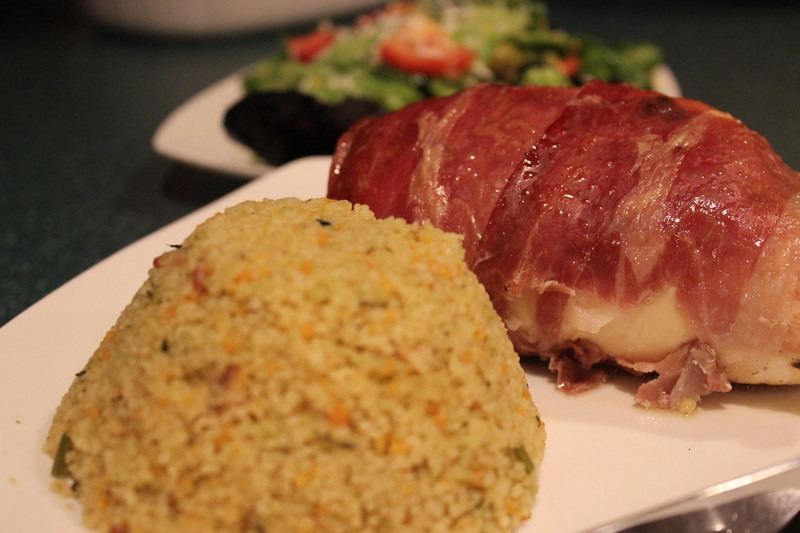 It looks good, it tastes great and it can be presented with a host of sides. 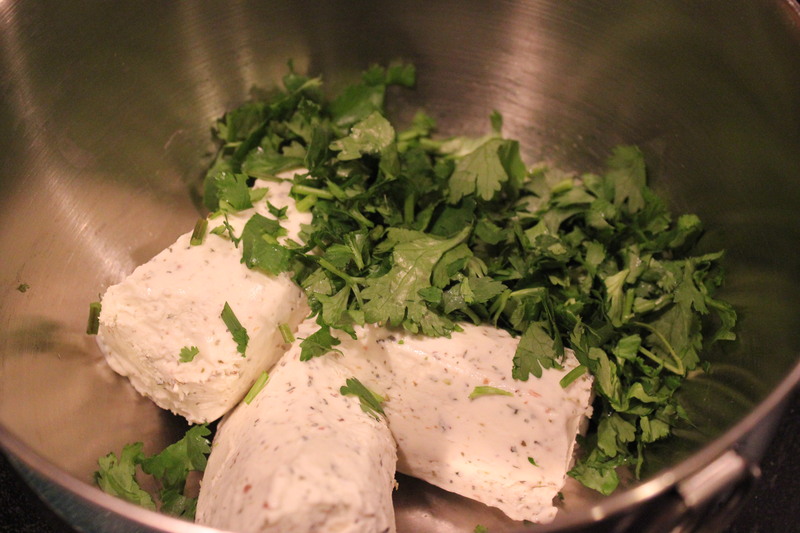 I make extra filling and use the leftover to add taste to another component to the meal; one of the side dishes for instance. Tonight I made multi colored cous cous; by adding the goat cheese mixture I had a great side dish and it was not any extra time to create. I also served this with a side salad. 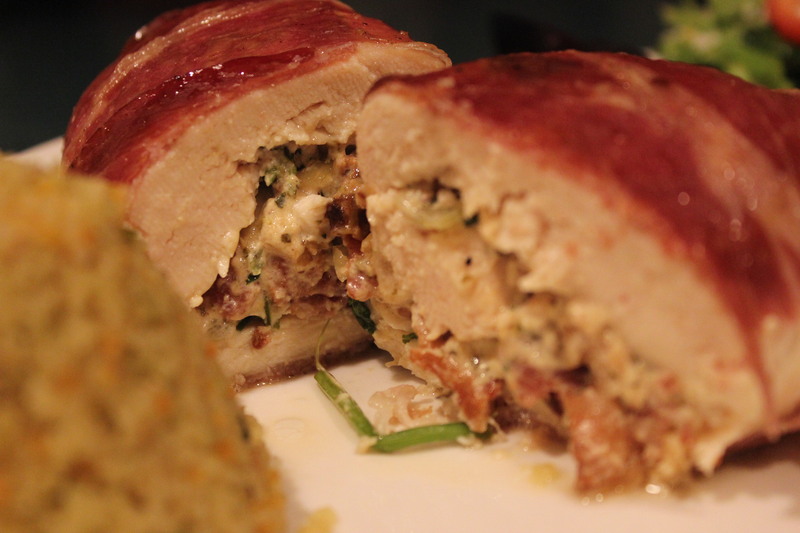 I think this chicken dish would be great with mashed potatoes, or pasta and a white sauce of some kind, maybe making the white sauce with the goat cheese… MMMM I may have to think about that the next time! 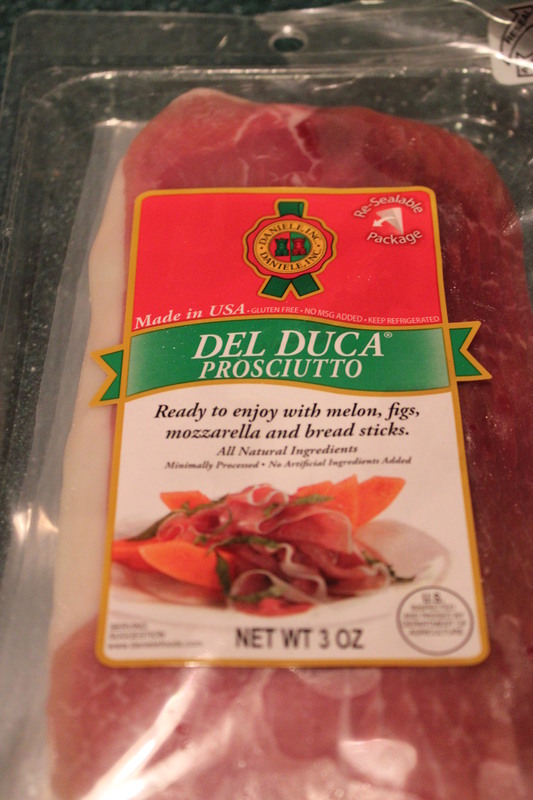 Anyway, I purchased one package of prosciutto, so in the end I only was able to wrap two of them in it; the other two got a plain salt and pepper rub. 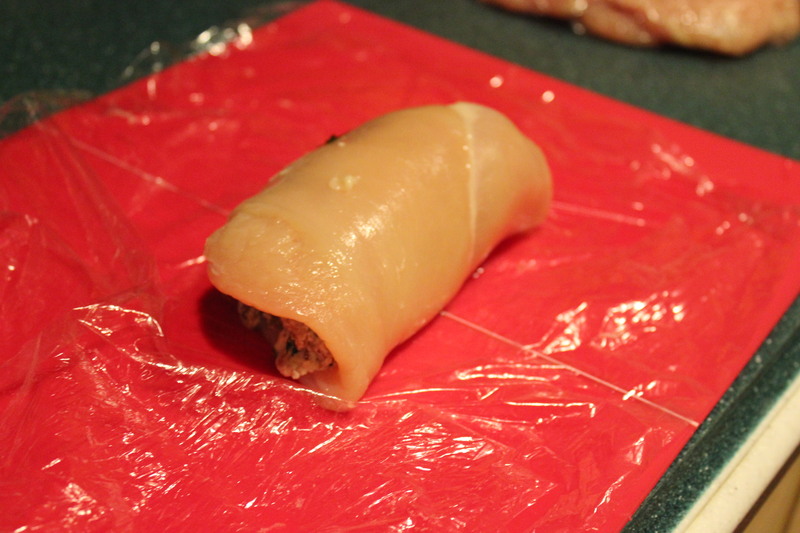 Just so you know it take three to wrap a chicken completely, NOT one like I thought. I shall keep this in mind for next time. As you can see, not a lot of ingredients, but a huge impact. I am not going to tell you how to cook cous cous or a salad as they are really just follow the instructions on the package. If you can’t throw a salad together you should not be in the kitchen, just a thought! 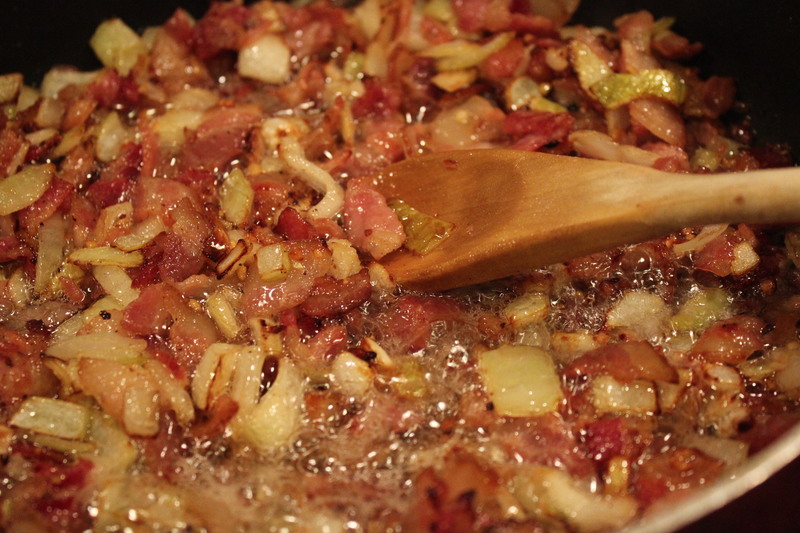 So start off by cutting the bacon into small pieces and cooking them on medium high heat. 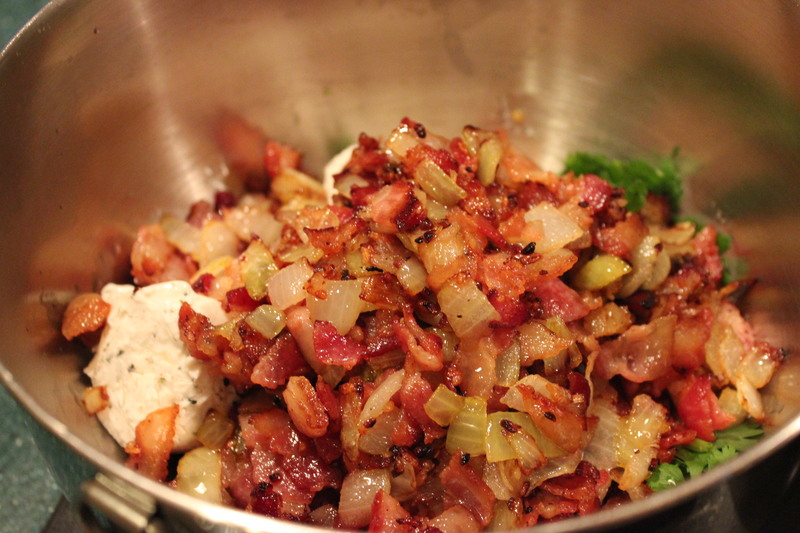 Once they are starting to crisp, and a lot of the fat has rendered you can add the onion and garlic. If you are not familiar with rendering here is a brief description (care of Wikipedia) Rendering is a process that converts waste animal tissue into stable, value-added materials. 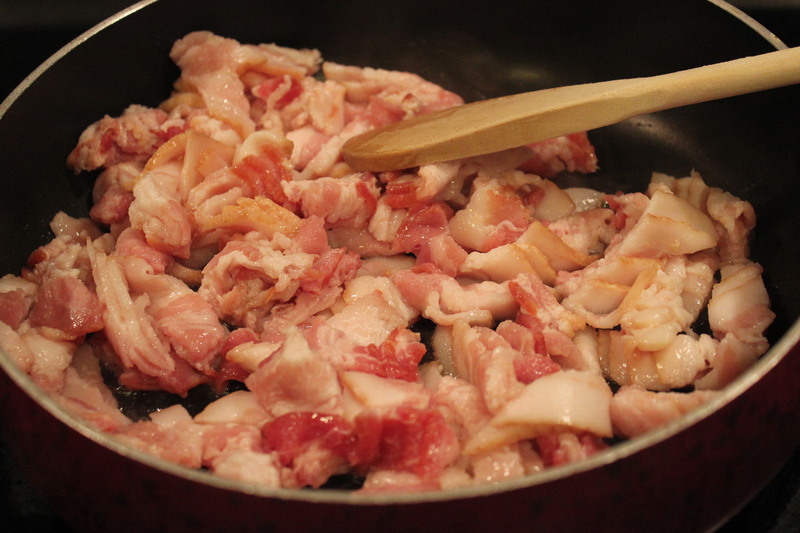 Rendering can refer to any processing of animal products into more useful materials, or more narrowly to the rendering of whole animal fatty tissue into purified fats like lard or tallow. Rendering can be carried out on an industrial, farm, or kitchen scale. This is Kitchen Scale here and anytime you take a meat product and cook it allowing the “fat’ to melt you are Rendering the product! Yay we learn something new every day, or not..
Continue to cook until most of the bacon is crispy (there will be some juicy pieces of the fat left and this is fine) set aside to cool for a bit, add to the cheese and mix it all together. 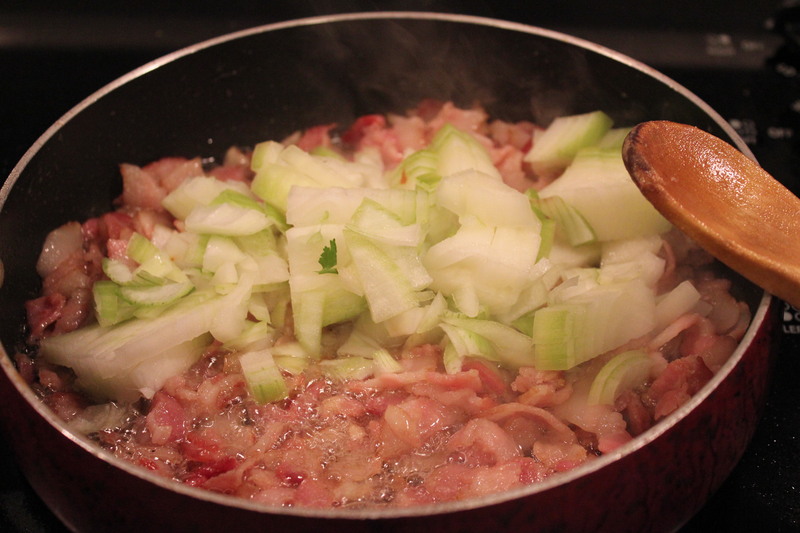 I kept the cheese in a bowl next to the stove to allow the cheese to soften, this way I could allow the bacon mixture to cool before adding. 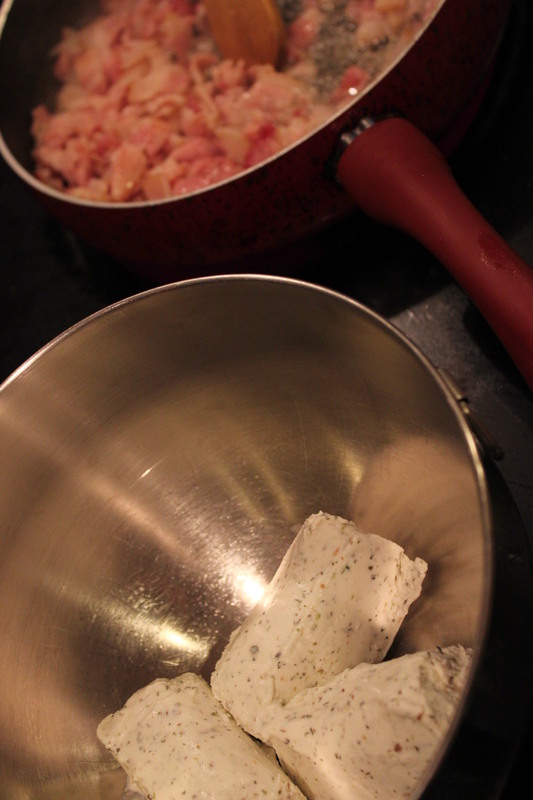 We don’t want to cook the cheese or melt it, we want it so incorporate nicely with the rest of the ingredients. 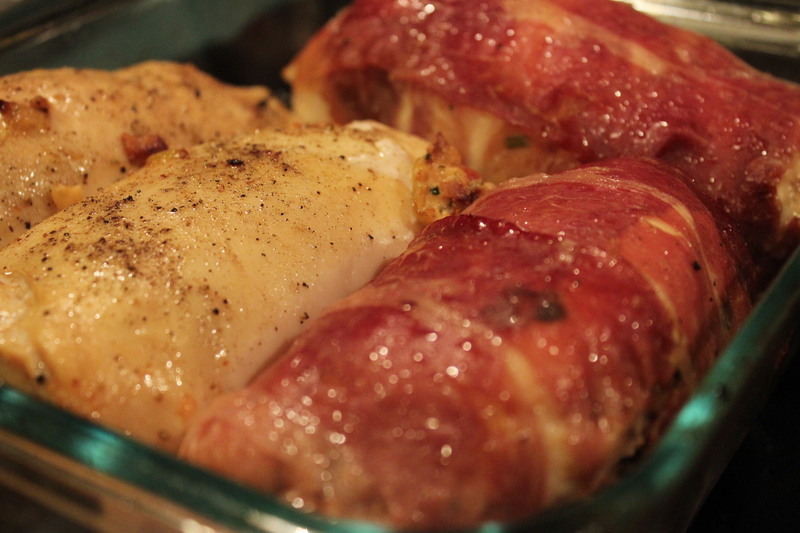 In a glass baking dish (I tried to pick one that the chicken would all fit into snuggly, this way they don’t unwrap and you have no need for toothpicks) using the rendered bacon fat, cover the pan in it and leave a little bit on the bottom. This makes not only the chicken not stick (Mandatory) but it helps to keep the chicken moist, and that is the ultimate goal here. No one likes dry chicken right? 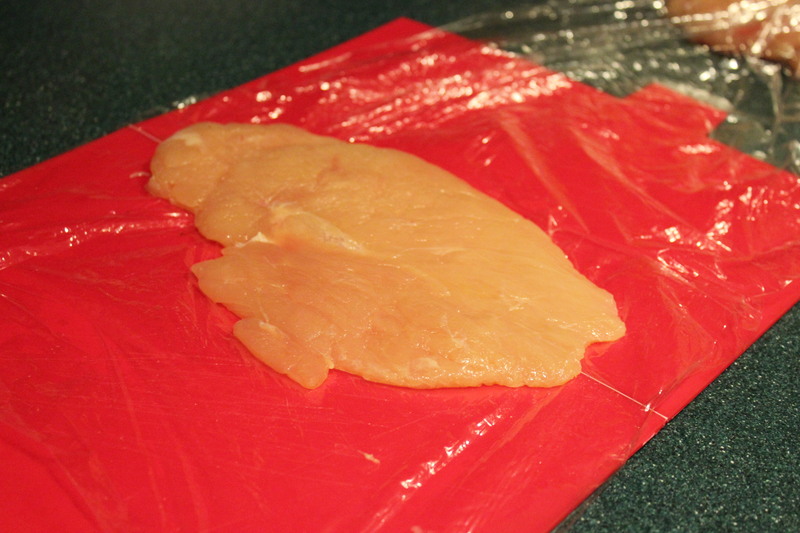 Take the breast and between some plastic wrap, pound it down until it is about double in size. I used a pastry roller. 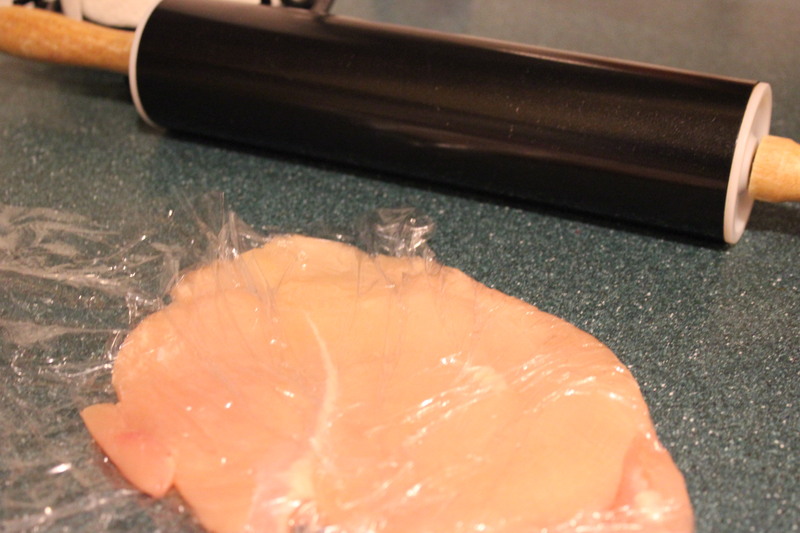 I feel that using a meat tenderizer kills the meat of the chicken tearing it apart. 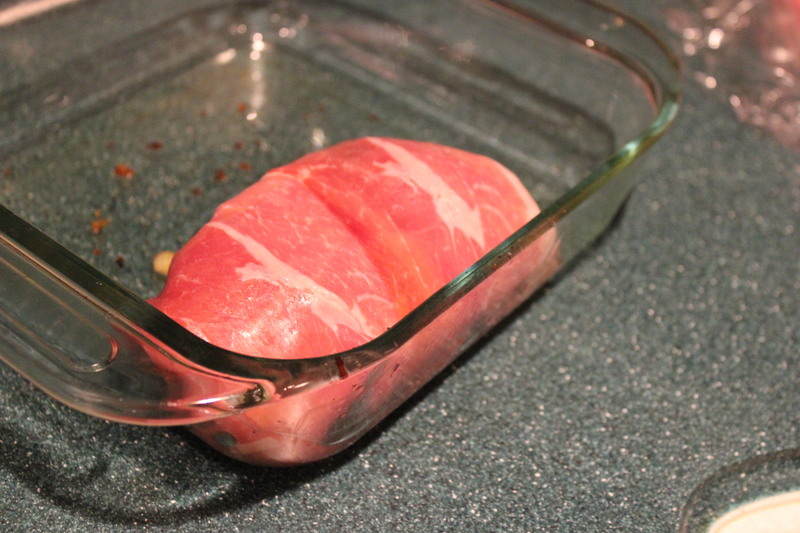 We don’t need to tenderize the meat we need to flatten it to make a nice vehicle that will hold our filling. (When I was a young mother just starting out, I used a freakin’ hammer to flatten my chicken (hell all meats) I had no idea in my early 20’s what to do.) I do hope by explaining this, what some might deem as fundamental, would maybe be the information that someone out there benefits from! 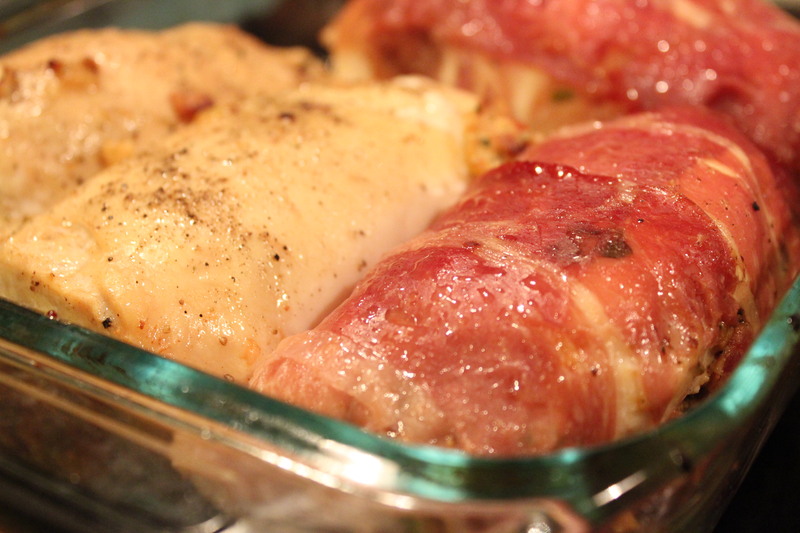 Scoop some of the cheese mixture onto the breast and wrap it up (don’t make it really tight, it is ok to allow it room to melt)This also creates the illusion of a larger portion, it is still the one breast, just looks and cooks larger.. Once you have it rolled, wrap the prosciutto around the breast and put it into a glass baking dish. 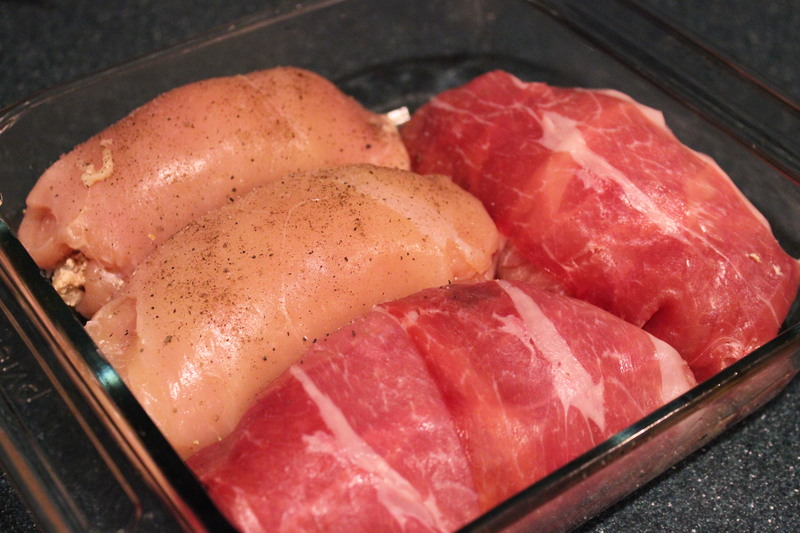 If not wrapping in the prosciutto then make sure to salt and pepper the breast for flavor, chicken is really bland if it is not eaten in tandem with another product. 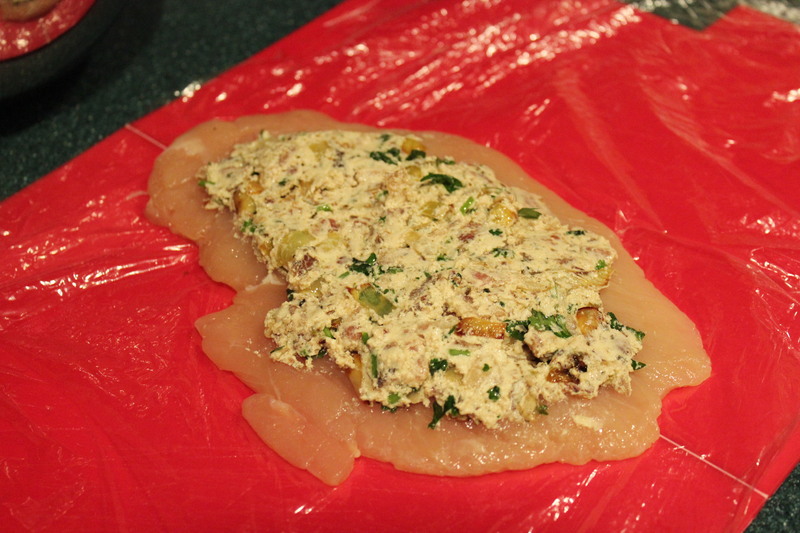 Cook in a preheated oven at 325 degrees for 20 minutes, turn the chicken and cook for an additional 20 minutes. Turn one more time and broil under a LOW broil for a few minutes to get the top a bit crispy. Serve with you favorite side dish. 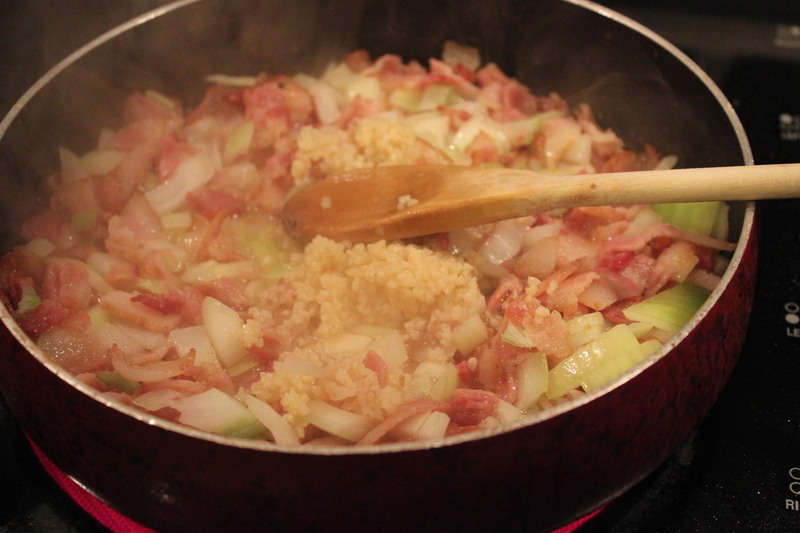 Remember to use the additional filling to create a dish that will have the similar flavoring and bring the meal together. It really was! Thank you for commenting!